Ever wish you could take a Jägermeister shot machine with you camping, tailgating, and partying? 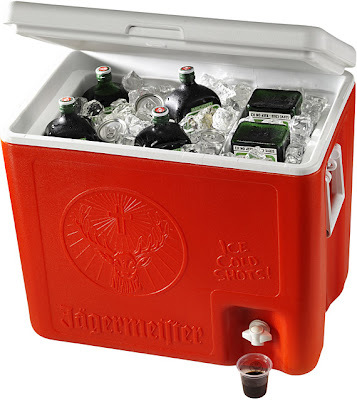 Now you can, with the Jägermeister 6-Bottle Shot Cooler ($120). Available as a six-bottle value pack, the cooler has plenty of room for all six bottles, ice, and the requisite cans of Red Bull, and uses the same tech as the Jägermeister Tap Machine to deliver ice-cold shots straight from the external tap. market, you can also search for these wonderful products online also. Check various websites, browse different colors and choose the best and most su [url=http://www.vickyfashionmarket.com/cheap-woolrich-outlet-arctic-parka-womens-fur-trim-coat-in-red-p-41.html]cheap woolrich outlet arctic parka womens fur trim coat in red[/url] Vajra Complex, General Bazar (Tobacco Bazar), M.G.Road, Hyderabad-500003.AP,India. 040-64555251 or 97000 57744.